How does Voice Search affect SEO? What are the new optimisation strategies for it? Voice Search has been around since 2002, however, it only turned popular after the rise in usage of smartphones. Personal digital assistants such as Siri and Cortana are now gaining popularity due to its consistent improvements. The consumers are now relying more on the voice search for online searching. 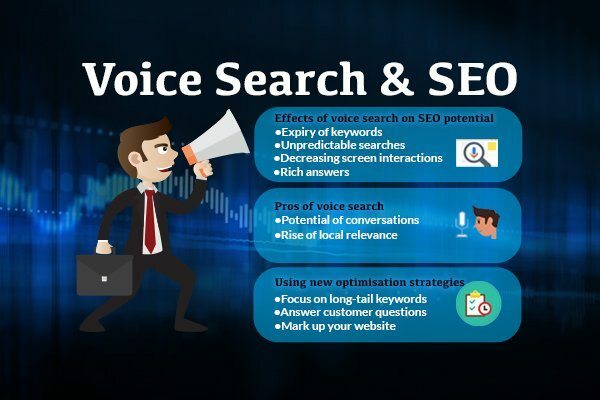 Voice search is expected to be one of the most important trends in SEO (Search Engine Optimisation) world besides quality content and mobile optimisation. A recent report states that 55% of teenagers and 41% of the adults use voice search daily and it is expected to double in coming years. The conventional use of keyword research and optimization came into being since 2011 bringing in a new mechanism for evaluation of quality content. The search giant Google no longer gives direct keyword ranking information. The search result of most of the queries are based on its context rather than finding a specific word. Voice search promotes context-based search results. Hence, the keyword specific search is now becoming less relevant as compared to the other new tactics of topic-optimization and long-tail keywords. Earlier, when people had to type keywords in the search bar to search for things, it was easier to predict the types of term they searched for and the queries asked. With the growing use of voice search, it turns difficult of predict the ways they search. For e.g. If you want people to search for your business, what are the possibilities they can speak verbally, rather than typing. Past SEO tactics mainly focused on claiming the areas of SERPs (Search Engine Result Pages). Wherein if the person asks one query he would get numerous solutions to it. This helped in having higher chance of success. However, consumers these days simply get answers without even looking at the screen. Hence, the value of SERPs is decreasing and so are the screen interactions. Rich answers gain more popularity in conventional searches and now even in voice search. They provide crisp, concise and direct information to the users rather than providing them with the list of other results. It can lower the click-throughs, if the answers are provided through conversations instead of text on the screen. With the SERPs dipping down, it doesn’t mean that your business too will suffer from the relevant new searches. The new voice search or digital assistants have a great potential of conversations through chats and calls with representative as well as online purchases. Additionally, your business gets verbal recommendations from search assistant. Mostly used on-the-go, voice search is often referred to as local SEO. Hyper-local optimization is expected to grow in its relevance. This is beneficial for businesses that have physical stores and who would be able to get more traffic and business and further are easier for local search rankings. Gone are the days when you focused on individual keywords. Start catching up with the long-tail keywords and topic keywords group. Mimic the type of phrases your customers and users use. Create individual page for blog posts, etc. which focus on addressing the common questions of your customers or users. Make use of what, when, who, why, where and how as these are most common and relevant in the voice search. Make use of schema micro-formatting to mark up your website and feed the Google answers to the common questions of the users. This promotes your website’s content as rich answer provider, thus, indirectly helps in improving the visibility of your brand. SEO is most adaptable, thus, make sure that your make the most of it to drive traffic to your business but only with accommodating new technologies, strategies and trends based on user behaviour.